• Describe the benefits of the wide screen monitor over the previous versions.  Understand how to operate the wide screen monitor. 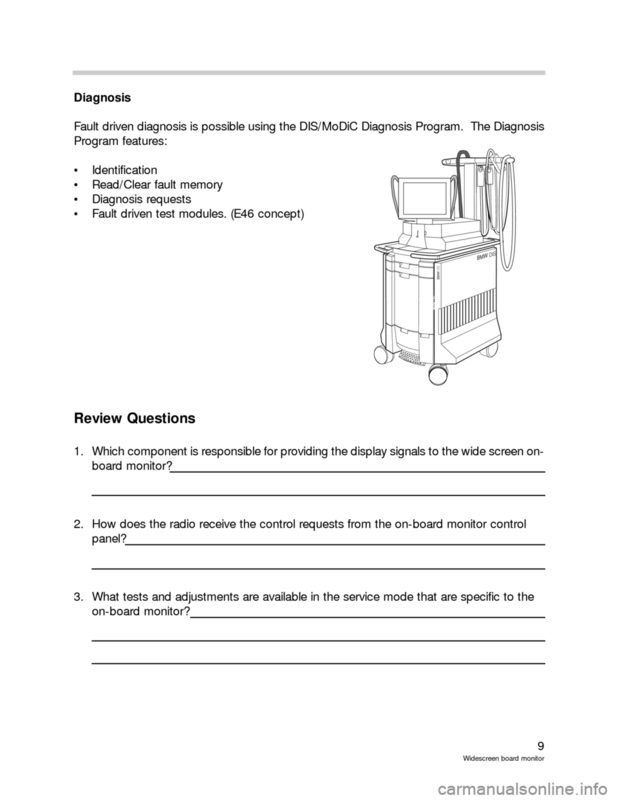  Review the procedures to access the Service Modes. tem and telephone can be displayed and controlled from a central location. 6.5’’ and an aspect ratio (length:height) of 16:9.  Larger display area and higher resolution (400X234 pixels).  Improved display screen technology (Ad-TFT LC).  Soft keys replace country specific audio function keys.  Used for all board monitor applications in all markets reducing variants. slot. The images will remain displayed on the screen. speed, the display will reverse direction. brightness level at all ambient lighting conditions. TELEPHONE STATUS LEDs / EJECT = Tilts monitor to access cassette drive. can be switched by holding button longer. TONE/SELECT=Tone: Dolby (cassette only) and audio adjustments. Select: Choose between station search methods (a,m or scan). 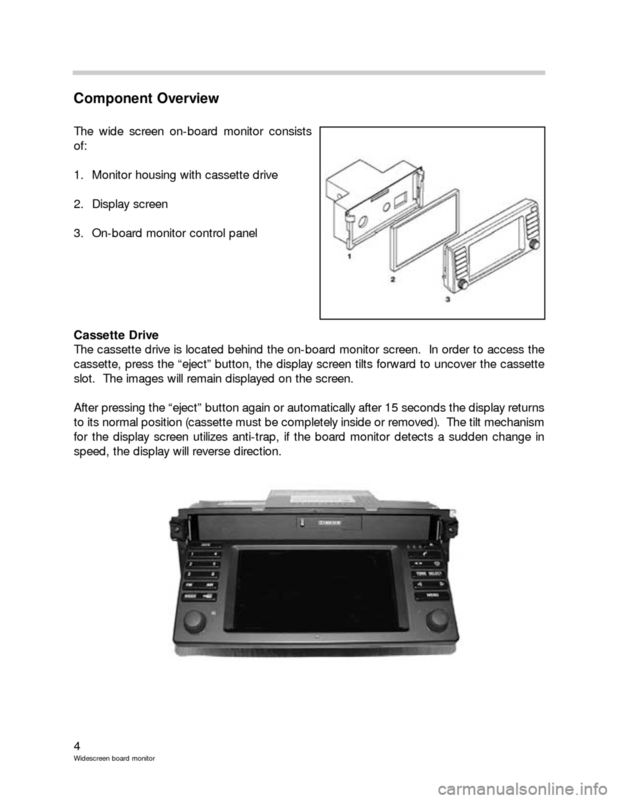 The on-board monitor is an input and display device that performs no internal calculations. transmits them via 3 shielded wires. 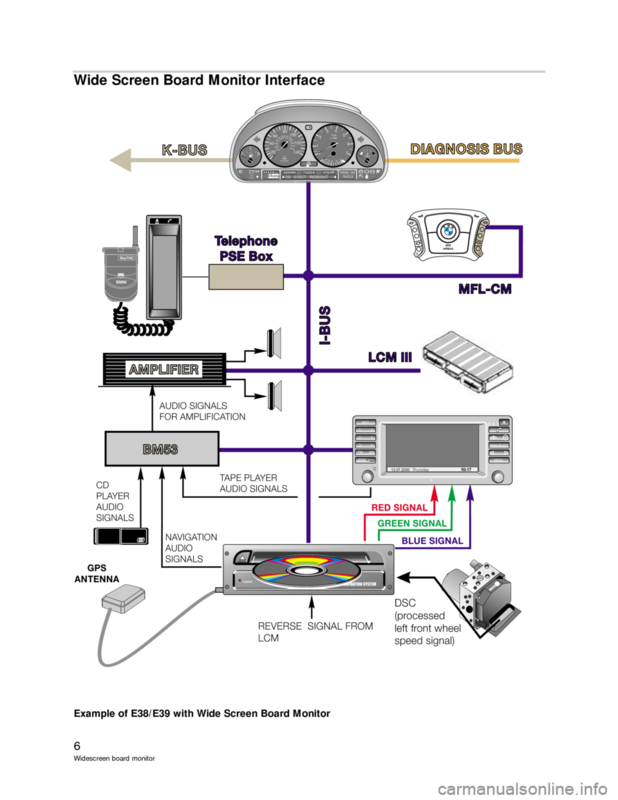 radio (located in the trunk or cargo area) for output to the audio system amplifier.  Turn the ignition key to position 1 (KLR).  Turn the radio on, then off, then on again.  Press the “INFO” button. From the selection list choose “RDS”.  Press and hold the on-board monitor control knob for at least 8 seconds. 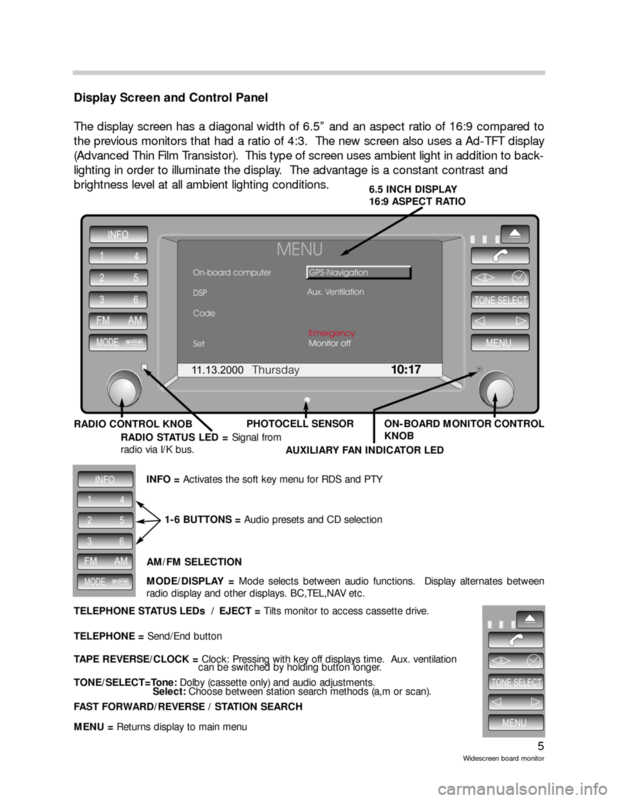  The audio display window will show the radio serial number as the first display.  The station search < > buttons are used to scroll through the various settings. 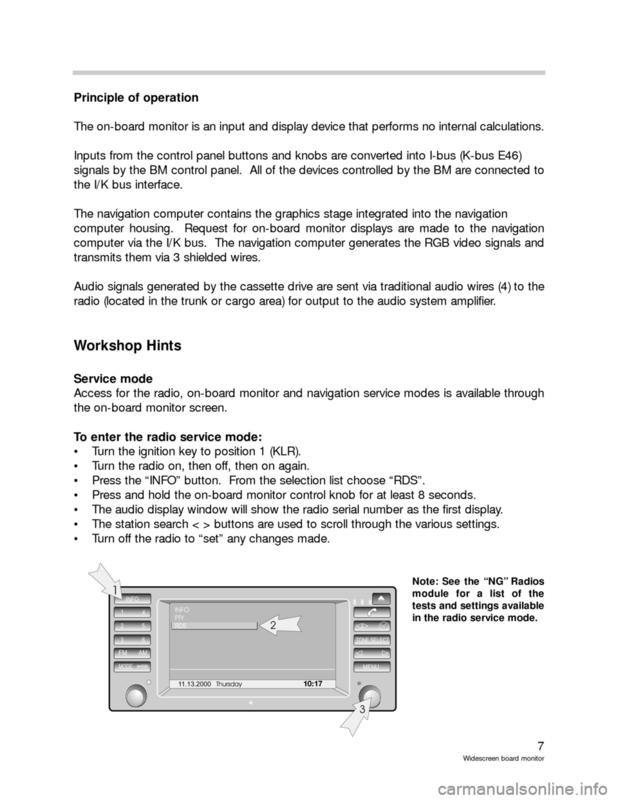  Turn off the radio to “set” any changes made. in the radio service mode.  Turn the ignition key to position 1 (KL R).  From the Menu screen select “SET”.  Once in the Set screen, press and hold the “MENU” button for 8 seconds.  The Service Mode menu will appear on the display. 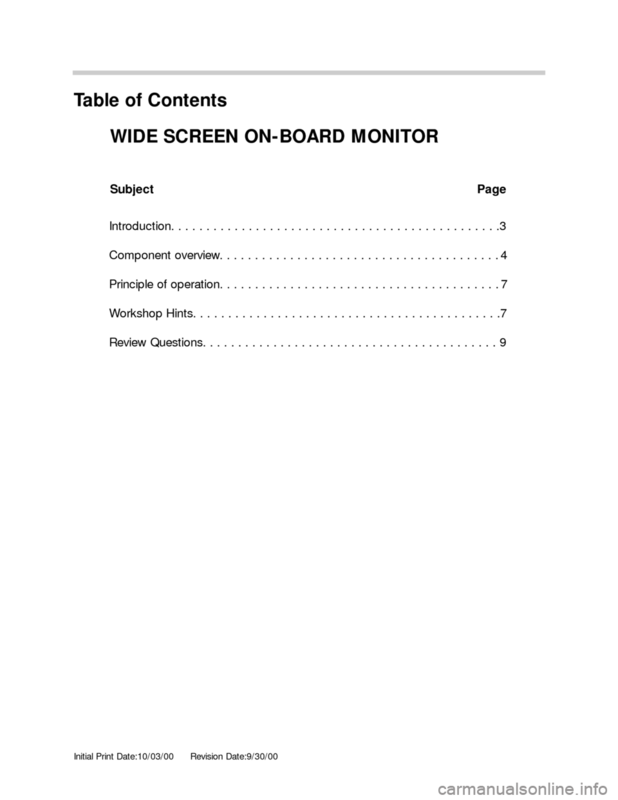  Select “On-board monitor” for monitor specific tests. 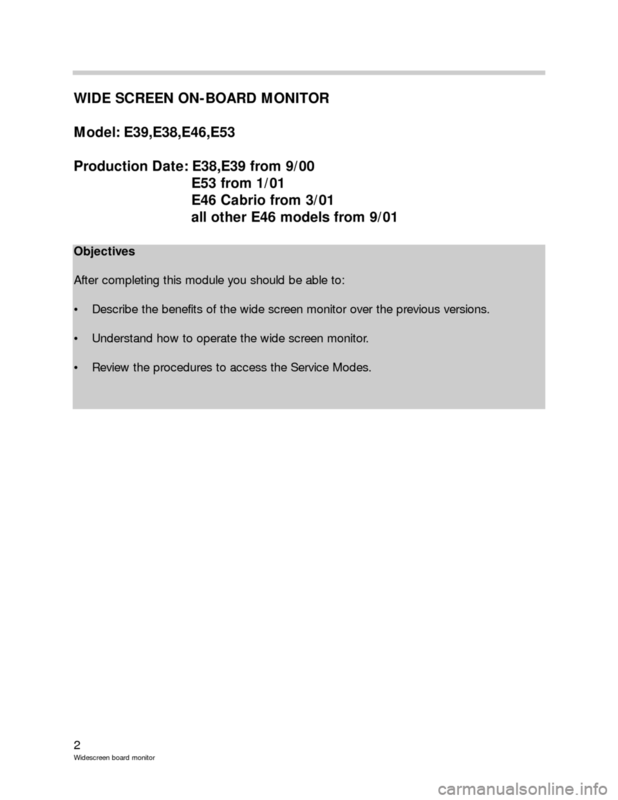 BMW 5 SERIES 2001 E39 Wide Screen On Board Monitor Workshop Manual view, print and download online for free. 9 Pages, PDF Size 0.64 MB. 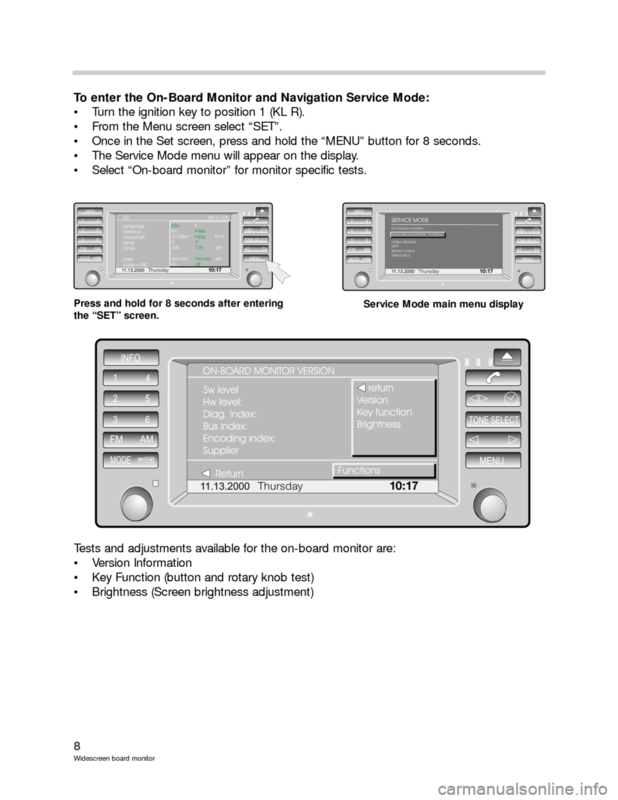 Search in BMW 5 SERIES 2001 E39 Wide Screen On Board Monitor Workshop Manual online. CarManualsOnline.info is the largest online database of car user manuals. 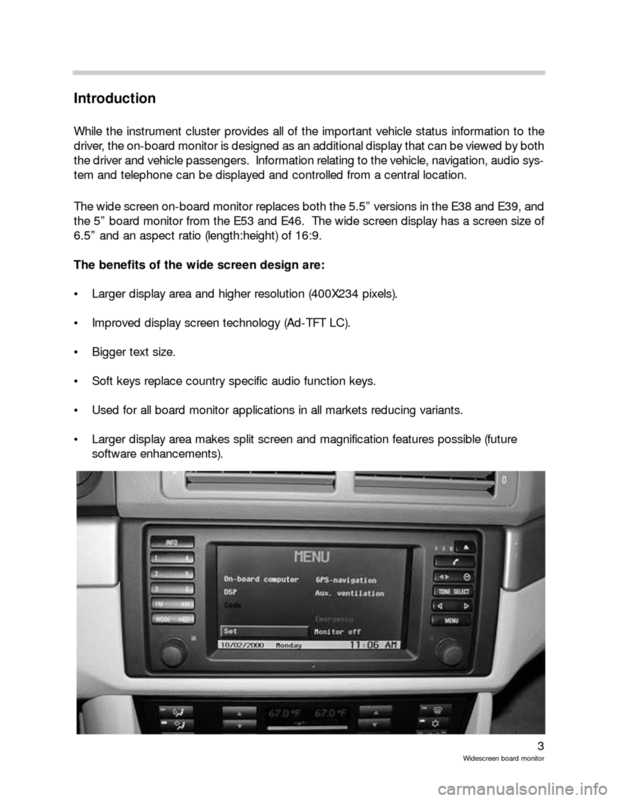 BMW 5 SERIES 2001 E39 Wide Screen On Board Monitor Workshop Manual PDF Download. Initial Print Date:10/03/00Revision Date:9/30/00 Subject Page Introduction. . . . . . . . . . . . . . . . . . . . . . . . . . . . . . . . . . . . . . . . . . .